Have you updated your Twitter and Facebook profiles lately? Are they looking dull and tired and in need of a makeover? Many people use social media to promote themselves and their business. If your profiles are outdated, you could be sending the wrong message. If you haven’t updated your profile in a year or more, you may not receive new connections, business leads, or sales. Why? Because your profiles may not reflect your current business, i.e., the information and link to your website could be incorrect. Twitter and Facebook constantly update their platforms. Facebook introduced Graph Search (allows you to look up anything shared with you; others can find information you’ve shared with them) and is testing a new feature that will compete with LinkedIn (keep reading to find out what it is). To refresh your social media profiles and make them stand out from the crowd along with taking advantage of the latest updates, use any of the following ten techniques today. If you want to capture more leads, generate more sales or donations, or simply add to your network, use a Twitter Card. The point of a Twitter card is to attach media experiences to your tweets that link to your content. Anyone who tweets links to your content will have a “card” added to the tweet that’s visible to all of their followers. Player Card: A Tweet sized video/audio/media player card (approval time may be longer). Product Card: A Tweet card to better represent product content (approval time may be longer). To use this feature, you’ll have to add some HTML coding to your website pages (specify which card you want to use). For example, if you want to use the Summary Card, all you do is place the following code: <meta name=”twitter:card” content=”summary”> in the HEAD section of your web page. Each card has a built-in attribution, e.g., website and creator. 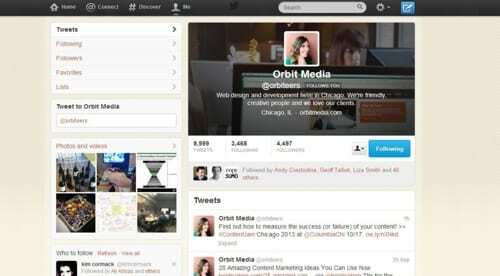 The website attribution indicates the Twitter account for your website, where your content was published; for example, @orbiteers. If you have an online magazine, you could separate your Twitter accounts, e.g., @mymagazine (for front page articles) or @mymagazinetravel (for articles in the travel section). The creator attribution indicates who created the content shown on a card. Not only can a Twitter Card spice up your profile, but it can generate more sales, leads, donations, and connections. Experiment with the different cards, e.g., photo and gallery card see which ones work for your audience. 2. Take advantage of the Twitter header. So many Twitter users still don’t have a Twitter header. If you have a Twitter background, create a header that’s in alignment with your brand (business or personal) so it’s easily recognizable by your target audience. Twitter recommends a header resolution of 1252px wide by 626px tall; however, the header will be resized to 520px wide by 260px tall. To create your header, use desktop publishing programs such as Adobe Photoshop, Paint Shop Pro, or free image-editing program. Need images? Check out the free images on Stock.XCHNG, Creative Commons, and other images sites. Apply cool effects to your header like gradient, fade, etc. Another tip is to create a word map using Word It Out or Wordle and use the image as part of your header. Or if you know a graphic designer, ask him/ her for help. Make sure to select the right color scheme for your Twitter header. Why? Because you want it to complement your background; test color schemes by creating a couple of headers. The one point to remember is that your header may not look the same on all devices. For example, your avatar (image in the middle of the header), could look smaller on a tablet or cell phone. Whatever you do, create a clean and eye-catching header, preferably one that matches your brand. 3. Use Twitter Vines to spice up your feed. What is Twitter Vine? It’s a mobile service that lets you capture and share short looping videos. Like Tweets, the brevity of videos on Vine (6 seconds or less) inspires creativity. Vine is available for iOS (Apple) and Android (download through Google Play) and you can connect it to your Twitter account. Once you download Vine, outline a video series. For example, if you teach yoga, upload short videos of you doing yoga poses. You can break up the videos into beginning, intermediate, and advanced yoga poses. Add a #hashtag, location, and/or web URL to your videos to ensure customers find you online. Want to upload the best videos ever? Use a tripod. Your videos will be steady instead of shaky. Use a good microphone for clear and crisp audio. 4. Optimize your tweets for your audience. According to Dan Zarrella from HubSpot and #SciChat, “Engagement is something that sticks with someone far beyond Twitter. Spend time focusing on content that resonates with your followers. Share things that will resonate with the people who follow you.” What does this have to do with your profile? Everything. If your profile states that you’re a social media professional, specializing in online marketing for small businesses, your tweets should reflect this. Test your tweets. For example, you may find that you receive more retweets if you don’t include a link. Maybe you want to see how many retweets you receive when you attach a video and/or image. How about the words you use? For example, studies have shown that the phrase Please Retweet gets more retweets. On the flip side, quotes seem to be over tweeted; unless, of course, the quote is directly from you. Use TweetReach to see how far your tweets, well, reach. All you do is enter your tweet into the box and click the magnifying glass or hit Enter and give TweetReach permission to connect to your Twitter account. Voilà! You’ll see how far your tweet went. Test and retest your tweet strategy for optimum reaches and conversions. 5. 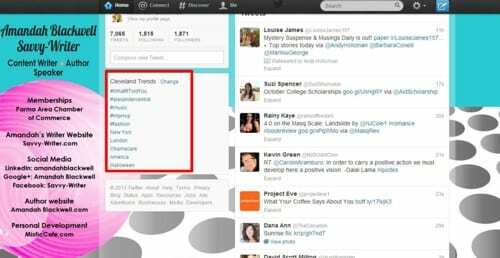 Kickstart a conversation with Twitter Trends. Twitter Trends identifies topics that are popular now. This will helps you find the hottest discussion topics on Twitter that matter most to you and your business. If you own a business located in Chicago, IL, Twitter trends will be tailored to your location and who you follow. If you want to see Trends that aren’t specific to you and your business, select a specific Trends location, for example, Cleveland, OH. When you click on any of the Trends, you’re taken to search results for that trend. You see all tweets including a hashtag or phrase. Want to see what people are saying about a previous Trend? Perform a search. 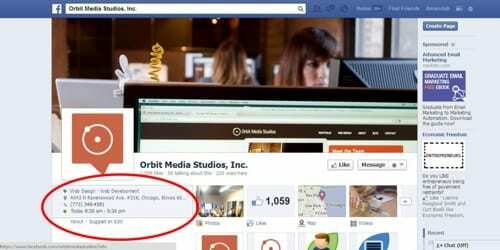 For example, type in web design business in Chicago, and you’ll receive results with #webdesign, #Chicago, Chicago web design, and other search results. As you can see, Trends is a great way for your audience to find you; it will make your profile stand out on Twitter. How? By including hashtags and links to your website and other social media networks in your tweets, potential clients and customers are only a click away from finding you. 6. Create a unique custom Facebook cover page incorporating 20% text. A picture is worth a thousand words! If you haven’t created a custom cover page (851px wide by 315px tall) for your Facebook page, now is the time do it. Why? Because Facebook keeps changing the parameters around cover photos and they can be to your advantage. For example, it used to be that your cover photo could not include more than 20% text. Guess what? That rule was quietly removed. However, you don’t want to be too sales-y. You get the picture. Play around with fonts and colors to make your copy stand out. 7. Write a keyword-rich Facebook profile. Just like Twitter, you must fill out your Facebook profile. Include important information such as contact information (address, city, state, zip code and country), what you do, website, email address, etc. Make sure to include links and pages; direct visitors to your website so they can read your full About and/or Bio page. Most importantly, use keywords! For example, if you’re a graphic designer from Chicago, use “Chicago graphic designer” somewhere in your profile. Why? Because anyone searching for a Chicago graphic designer will find you, your website and social networks; test and retest keywords. Use this guide How to Research Keywords to find your keyword phrases. You can even look at your competitors keywords. How? View their source code. For example, in Google Chrome click on Tools and then click View Source. See what keywords/phrases your competitors use and use the same ones, but also localize them for your area. For example, if your competitor uses freelance ghost writer as a keyword. You can use Chicago freelance ghost writer – this localizes the keyword phrase. 8. 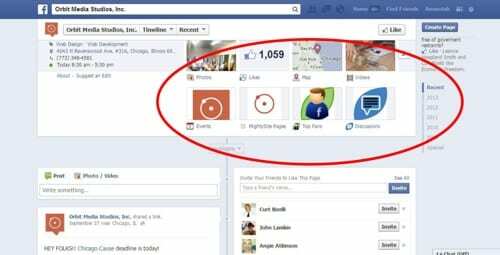 Add useful and unique applications to your Facebook page. There are plenty of apps to choose from, just make sure to select the ones that will work for your business. 9. Evaluate your Facebook tab thumbnails. When is the last time you updated your thumbnails. These appear below your cover image and link to the apps you use. Since you can only show three tab apps to visitors, make sure they’re eye-catching and capture a visitor’s attention. How? 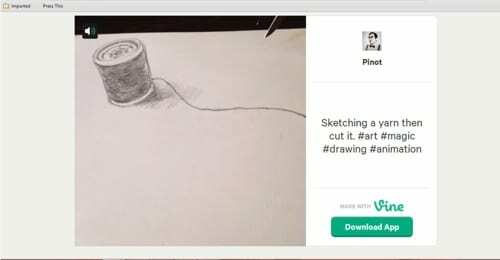 Click on the Pencil Icon next to an app and then click Edit Settings. Give your tab a Custom Name, for example, FREE Tax Saving Report. Click Save and then Okay. But if you really want your tabs to get noticed, create custom tabs. Again, you’ll need a multi-media program such as Gimp. Open up your chosen program and use simple fonts and colors that complement your cover page. If you have an app for videos, you could use an image of a video camera or someone from your office who is giving a video presentation. 10. Use the LinkedIn-like ‘Professional Skills’ section when Facebook implements this feature. Get ahead of the competition with Professional Skills from Facebook. That’s right! Facebook has been quietly testing a new option that allows users to add their professional skills to the work and education section of your timeline. The feature mirrors the one available on LinkedIn. All you have to do is go to the About section on your profile and scroll down – the feature will be underneath the Work and Education area. What sets Facebook’s feature a part from LinkedIn is that it’s actionable, meaning you can click on your skill and connect with others who share your same interest or who are looking to hire a person with your skills. All people will have to do is run a query using Graph Search and voilà! Your name will appear in a search. You now have the opportunity to network and possibly find a new job or business associates or investors. The number of people joining Twitter and Facebook increases every day. If you want to express your authority and gain leads, connections, and sales, you must show up and be seen and heard on these networks. It’s important to create a winning profile and to update it from time-to-time. Why? Because you’ll grow as a person, the skills you have today may not be the same you had yesterday, or you’ll enhance them. Take a look at your competitor’s profiles and borrow techniques from them, make them your own. Create an eye-catching profile and you won’t get lost in the crowd on social media. Have I missed anything? Let me know if the comments below. Amandah Blackwell is the owner of Savvy-Writer and provides content writing and marketing to companies within markets such as nonprofit, health and wellness (fitness), publishing, the arts & entertainment, pets, and real estate. 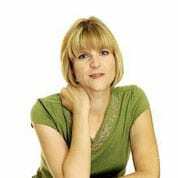 Connect with her on Twitter, Google+, and LinkedIn. When not writing, Amandah enjoys traveling, volunteering and hiking. Great article Amandah, I love your suggestions. Using these little tricks is essential in order to make your page stand out and to get the attention of your visitors. In our experience, organizing various types of promotion can really help you get more visitors and increase engagement among the users. Most of the studies confirm that one the most common reason why people follow a brand on social media is to get special discounts, coupons, etc. Businesses should use this fact to increase their base of consumers. Organizing your promotions is a great idea. Clients and customers appreciate contests, discounts, coupons, etc. If you’re a part of a chamber of commerce, you could promote a ‘special’ member discount. Nonprofits can benefit from using promotions too. It’s a great way to raise awareness and donations. Twitter cards are becoming more and more popular. Many brands use them with successful results.